What’s the Worst Thing an Aspiring Writer Can Do? Do you have a great idea for a book? Or, do you have a finished manuscript, and believe it’s ready to publish? Or perhaps, you’re somewhere in between. Maybe you’ve crafted it to the very best of your ability. Taken classes and/or workshops, written, revised, polished, and you’re ready to hit the marketing end of things. Whether that means querying agents or self-publishing. You want to become a published author so badly, you’re ready to jump right in! But wait. Let’s all take a deep breath here, and consider this from a different way. If you’re been in these trenches a while, you know how this industry has changed, quite radically, over the last decade and a half. We’ve all done that at some point. Or maybe you’re just getting into this game. You see people self-publishing and becoming famous, and you want your piece of that pie. I don’t know about you, but I’ve heard it a lot. Whether at writers’ conferences, speaking to folks new to the game, or even to those who have trudged all those miles trying to get someone interested in their books. It can be frustrating, indeed. That ups the odds a bit, no? But we might as well know what’s really at stake. Faced with all of this, the one huge mistake I see writers make all the time, especially new ones, is to jump right into publishing. It’s oh-so easy these days, and cheap to do as well. For a precious few dollars and an upload through self-publishing sources, in a snap, you’re a published author. Did you know that within the industry (Traditional publishing), you’re only considered an author if a publisher purchases the rights to publish your book. And not where you’re required any financial outlay—including (but not limited to) being required to buy a certain amount of books from the publisher. That’s one of the ways self-publishing places try to get around the moniker, and hold themselves out as being “traditional,” when they’re actually not. In short, if you’re required any financial outlay at all, then it’s a self-pub business. 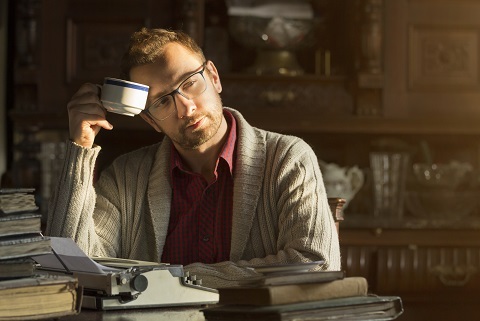 Within the publishing industry, if you do any of that, you’re seen as a self-pubbed writer. Not an author. And if you aspire to ever become an author, this will set you back 21-0 at halftime. But say Traditional publishing is not your goal. Your goal is to get your book out, and market the hell out of it. All fine and good, if that’s all you want. Just know that you’ve heard of those folks who did it this way, and are famous, because they’re 1 in 10 million. Rarely does a self-published book go onto any success. In fact, the self-pub businesses count on you selling about 50 books—which you’ll buy to sell or give to your friends. And that’s it. It’s one of the self-pub industry’s dirty little secrets. But either way you go, the very worst thing you can do is begin the marketing prematurely. Let me explain a bit, so stick with me here. One of the great thing all those gatekeepers in publishing did, was force writers to settle in for the long haul. Writers, in order to pursue the goal of publication, while querying all those agents, kept writing. Kept learning. Kept editing and writing and revising and writing. And you know what happens when you do that, right? Yep—you become better and better and better. Sadly, this isn’t happening a lot today. The self-pub market is glutted with millions of new titles every year, the vast majority of those coming out quickly from new writers who just want a book out. And let me say this straight—those books don’t sell, no matter the fancy marketing. Millions of new writers are out tons of money, mainly spent on this marketing, with nothing to show for it. I hear the stories every single day from deeply disappointed new writers. But the good news is, this doesn’t have to be you. And here’s the secret. It sounds simple. And it is. No matter how badly you want this (and remember—that’s part of it. You wouldn’t be writing if you didn’t dream of publishing), take a deep breath. Slow down. Learn your craft. There is so very much to learn here. And again, you’ll only get better and better and better as you go. The very last thing you want to do is to toss a book out there—only to look at it years later, once you have learned so very much more, found your true voice, perfected your craft—and cringe. It all comes down to you. You are the caretaker of your craft. The stories you write, the people in them, the prose that propels it all forward, all of those rely on you to not send them out in their work clothes. One thing I can promise for true is that while some talent is needed, the rest of what goes into great books is about skill. And the skills can be learned. So go to it. Curb your publishing enthusiasm, and put all of that squarely in learning the skills, in writing, in revising, in going on to write another book. Then pursue publishing with a book that will make you proud.